The first Government Council has stepped down after a very successful first term. The new election race starts today - to register as a candidate costs just 500k Credits, transferred to OEDev Paul, OEDev Brandon or OESupport Bill (please send an in game mail to explain your transfer). Adverts cost 200k Credits and are reserved on a first come first served basis. Registrations close at midnight GMT Monday 21st June. The election will happen two weeks later after the campaigning period. Contrary to the claims of the PvP Party, the Commonwealth is indeed the Nyridion Galaxies oldest political party. 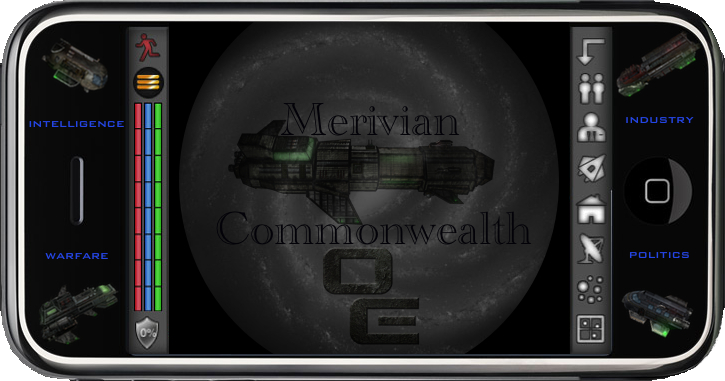 Forged out of the political alliance of the Merivian Commonwealth, we decided that in order to ensure our interests are looked after we must stand behind a single representative. That is not to say that the Commonwealth candidate or Councilor will serve the Commonwealth solely. During my term I was a strong advocate for Indy players, the Academy and small factions in addition to being the Commonwealths Representative. At times I disagreed with the views of many, including Commonwealth players, but always pursued the best interests of the Commonwealth and other players and groups I vowed to stand for. The Second Elections are starting up and I wish luck to the next Commonwealth Candidate on their mission to guide the development of the galaxy. Congratulations to Nick Succorso for winning the primaries in the Commonwealth. Good luck on your election campaign, I know the galaxy would benefit from your wisdom.